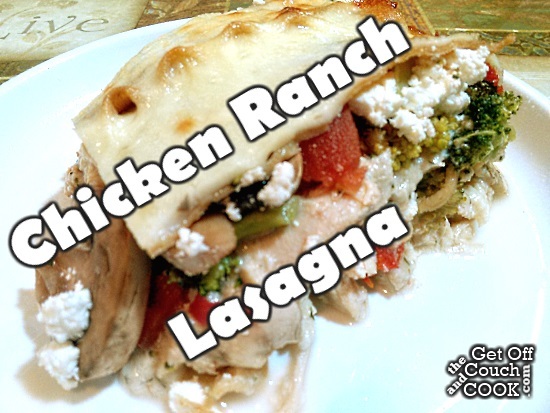 Shredded chicken, a white cheese sauce with ranch seasonings, and lots of veggies? Oh, yes, please! Hey, all! Mr. Onion-Hater here! Everyone has a favorite meal from their childhood. I mean I don’t care if we’re talking about Grilled Cheese, or maybe Mom’s Pot Roast (even if it’s as tough as an old leather boot), or even Mac and Cheese from the box! We all have meals that just make us kids again when we think about them and especially when we eat them! Mine is lasagna. No question. My mom made a killer lasagna. It was a family staple. Hell, it was such a huge part of growing up that the first thing my sister ever learned to cook on her own was lasagna since she considered herself to be part Garfield! This lasagna that Sashi came up with. . . isn’t your mother’s lasagna. The basic concept is the same, sure. We have pasta, cheese, a sauce, and it’s baked. But that’s about where the similarities end. 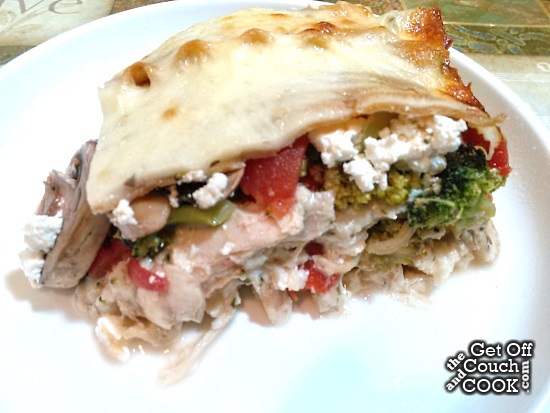 This lasagna has layers of shredded chicken with mushrooms and broccoli. Not something that my Midwestern household would have ever considered even on our most adventurous days! But then the traditional red sauce, marinara if you like, is completely turned on it’s ear and replaced with a white cheese and cream sauce with ranch seasonings. But never fear the cheese is still here! In this lasagna we have some homemade ricotta and a generous portion of mozzarella. I mean you HAVE to have the brown bits of cheese to fight over and with right? Otherwise what’s the point of having lasagna?! Truth be told though the plan was to have bacon in this as well. Big surprise huh? It would be best browned to a crisp and crumbled on the top prior to baking. But the bacon gods decided that this was more than good enough without. . . because we didn’t have any in the house. And, if I’m being honest here, this was a fabulous dish that was both reminiscent of my childhood favorite while, at the same time, still pleasing my more grown up palate. Preheat oven to 350º. Coat a deep 9×13 baking dish with nonstick cooking spray and set aside. Bring a large pot of water to boil for the noodles. When boiling, add the noodles and cook for the minimum time on the package. Drain and rinse with cold water. 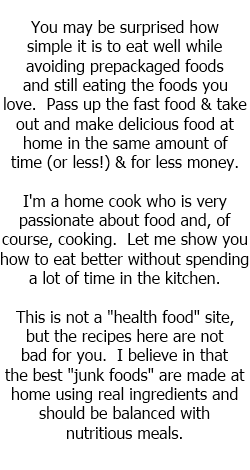 Meanwhile, place large 12″ nonstick skillet or Dutch oven over medium heat and melt the butter. Whisk in the flour and keep whisking until smooth and golden. Slowly whisk in the milk until smooth. Let cook until it starts to bubble. Stir in the garlic, parsley, garlic powder, salt, dill and chives. Continue heating until bubbly and starting to thicken, 5 min or so. Turn off the heat and . Stir in 3/4 of the mozzarella and all of the Parmesan. Whisk until smooth. Stir in the chicken. In a large bowl, mix the broccoli, tomatoes and mushroom with a large pinch of salt. Add about 1 cup of just the sauce (a few chicken pieces are okay) into the bottom of the baking dish. Lay 4 of the noodles over the sauce in the pan, overlapping as needed to fit.Top with 1/2 of the remaining sauce, 1/2 of the vegetable mixture and 1/2 of the ricotta. Repeat with 4 more noodles, the rest of the sauce, the rest of the vegetables and the rest of the ricotta. Top with the remaining 4 noodles and sprinkle with the remaining 1/4 of the mozzarella. Bake at 350º for 30-45 minutes or until the cheese is melted and golden brown. Let sit for at least 15 minutes before serving.